Style # HE257 may be set with a moissanite by choosing this option in the drop-down menu. At deBebians, we have recently started carrying Forever One Moissanite by Charles & Colvard and The Harro Gem as options for the center stone on most of our engagement ring settings, including many Bel Dia engagement rings. This delightful gem has continued to gain popularity due to its enticing qualities and benefits. Let’s take a look at just a few reasons why people are choosing to purchase this beautiful, lab created stone for an engagement ring or other piece of fine jewelry. deBebians carries premium quality Forever One Moissanite by Charles & Colvard and The Harro Gem. 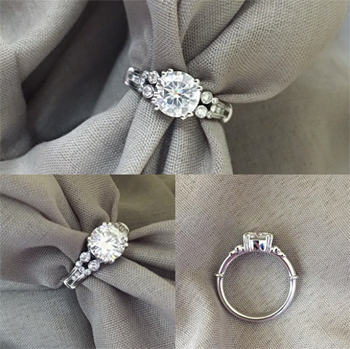 Each center moissanite is considered colorless and grades equivalent to a D-E-F diamond. You may learn more from our moissanite education page. Forever One Moissanite and The Harro Gem are eye-clean, meaning that there are no visible inclusions to the naked eye. We have strict quality control standards and select only the most beautiful stones for our engagement ring settings and other fine jewelry. Forever One Moissanite is cut with precision to increase the stone’s brilliance and sparkle. Your chosen gem will be up to 10% more brilliant than a diamond. 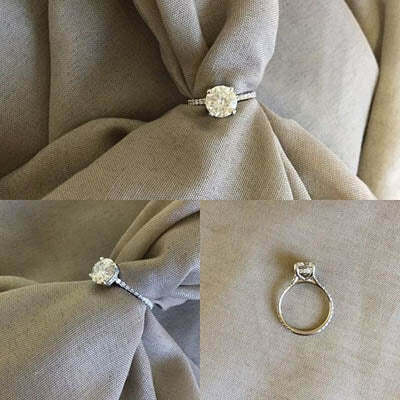 Forever One Moissanite and The Harro Gem is an incredibly affordable option for a center stone for an engagement ring or other piece of fine jewelry, such as a pendant. Currently, you can add a 6.5mm (1.00 carat diamond equivalent) Forever One Moissanite to a halo engagement ring for $383.00. I performed a loose diamond search for a diamond equivalent and found a 1.01 carat GIA certified I color VS2 clarity diamond with excellent cut for $4,589.00. Diamonds are the hardest natural substance on earth and score a 10 on Moh’s scale of mineral hardness. Moissanite scores a 9.25, making it an ideal stone for jewelry that can be worn and enjoyed each and every day. Charles & Colvard provides a Limited Lifetime Warranty for their Charles & Colvard Created Moissanite®. To learn more, please review their complete warranty information. Please contact a deBebians jewelry expert if you have any questions. To choose Forever One Moissanite or The Harro Gem for the center stone option for an engagement ring, use the drop-down menu provided to make your gem selection in addition to the metal type and finger size. Update September 29, 2015: deBebians now offers Forever One™ Moissanite by Charles & Colvard®. Learn more here. Update on December 21, 2018: deBebians now carries The Harro Gem.